Every year here at Bowsite.com we read reports of treestand accidents on our forums. With very few exceptions, these accidents could have been avoided by the proper use of safety equipment. In this feature we are spotlighting the latest safety equipment made by Summit Treestands - the leader in treestand safety technology. Bowsite Discussion - Have you ever fallen from a stand? Instead of simply showing you the equipment, my two sons (Matt, age 6 and Patrick, age 8) are demonstrating proper use of these items for their very first hunts. The reason for this is two-fold. I wanted to prove that using this equipment was so simple that even a child could use it. But I also wanted to make you think about this question: would you put your child in a tree without a reliable safety system? I'm confident the answer to that last question is NO - so then my next question would be why is it OK for many of you to have no safety gear on? Ten years ago I would never consider having young children with me in a stand. It was simply too dangerous for them. But today, with the advances in safety equipment, they get to enjoy the thrill of bowhunting at an early age - and I don't have to worry whether they (or me) are at risk. The first thing I did was to put on my Seat-O-The-Pants Fastback safety harness and lineman's belt to hang the BuckSteps and Treestands. My BuckSteps were placed close enough so my youngest son Matthew didn't have to reach too far to make the steps. Once the steps were in place, I hung my Copperhead X4 (non climber) and secured myself to the tree. The next step was to lower my pull rope where my son tied the Viper and I pulled it up and hung the Viper as I would a hang on. I like for them to use the Viper because it has a wrap around bar. This gives me an additional level of comfort. The kids like the stand because it's comfortable which is important. Once the stands were in place, and while I was still strapped in, I installed the Seat-O-The-Pants Climbing System and lowered it to the ground. Getting Started - The BuckSteps in place, I climbed up the stand and secured the rope for the Climbing System. Then I climbed back down to secure my son Matt. I climbed back down, using the climbing system and double checked Matt's harness. Both my son's are monkeys and not particularly afraid of heights - so they were not the least bit nervous climbing into the 20' high stand. At every step, my sons have been taught to stop and raise the Prusik Knot which is the key to the Summit Climbing System. This ensures that should they slip, the will not hit the ground and simply hang suspended by the rope. Matt easily climbed all the way to the top and onto his Viper Stand - already set up and ready for him. Climbing in safety - Here Matt demonstrates the use of the climbing system. We practiced this a number of times in the yard prior to his first climb. I then climbed up into my stand, situated right next to him and we both enjoyed a great deer bowhunt. While Matt did not get to see me shoot a deer on our first day out - he sat for 10 hours quietly and we saw 10 deer, 5 turkeys and two raccoons. Stand Safety - I had setup the Viper X4 stand for Matt as a hang-on, even though it is technically a climber it was the most comfortable stand I had, in addition it has the wrap-around bar which makes Dad more comfortable. Two weeks later it was my older son Patrick's turn. Patrick used the exact same gear as Matt. Only this time the deer cooperated. We had a nice fat spike walk under our stand. Pat learned a valuable lesson in QDM as I explained that I couldn't shoot the spike - we needed to let him get older and pick out a doe instead. I was certainly tempted - the deer was just 15 yards from the stand quartering away. But our patience was rewarded when 4 does came by 30 minutes later. I made a perfect shot on the lead doe at 20 yards - taking her in the heart. The deer went down right in front of Patrick. I don't know who was more excited - probably me but it was a toss up. 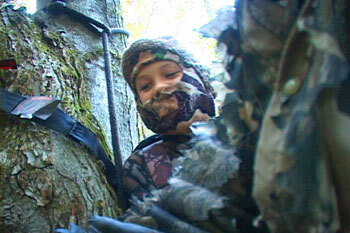 Hunting in Safety - Here my older son Patrick securely watches on as I killed a 'boss' doe. Thanks to advances in safety equipment, I got to enjoy something I've always dreamed of - sharing my love for bowhunting with my kids. But even if you don't have kids, or they don't hunt. Don't take a chance. Every treestand accident victim I've met all say the same thing. They didn't think it would happen to them. Don't take a chance. The time and effort involved in setting up the proper safety equipment is negligible and the cost is low. I've climbed hundreds of trees and each time I am wearing my safety gear. If you don't want to do it for yourself - do it for them. Watch this deer shot on video - Pat Jr.'s reaction and blood trail. Time it takes to put on a Fastback Harness 45 secs. Time to attach your Harness rope to the tree 30 secs. Time it takes to climb without the System 30 secs. Is 3 minutes and 15 seconds out of a 4 hour hunt worth an 50% chance of paralysis? Only you can answer that question. Never carry equipment with you while climbing. Use a haul line to raise or lower your gear. 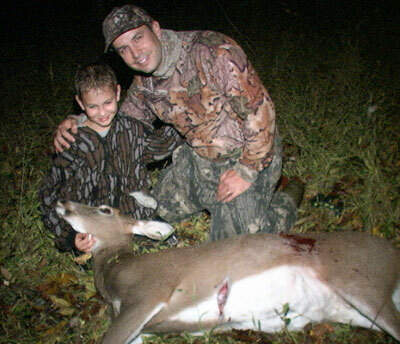 Make sure guns are unloaded and broadheads are covered prior to raising or lowering firearms or bows with a haul line. 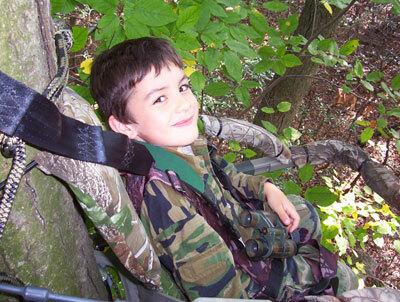 Since most accidents occur when hunters are climbing up or down a tree, always use a climbing belt. 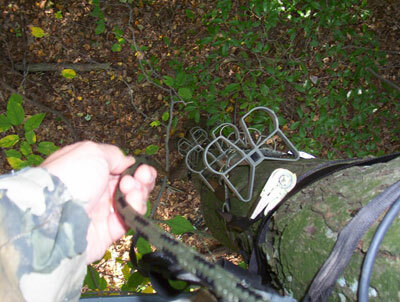 Always use a safety belt or harness when hunting from elevated tree stands. Study manufacturer’s recommendations before using any equipment. Never use a rope to replace a safety belt. Read, understand and follow the factory recommended practices and procedures when installing commercial stands. Inspect portable stands for loose nuts and bolts each time they are used. 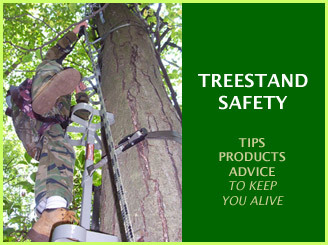 Choose only healthy, living trees when using climbing devices. Rough-barked trees such as oak are best. Do not use a tree that is rotten or has dead limbs. Never put all your weight on a single branch. Keep at least one hand and one foot on a secure place when reaching for the next hold. Climb higher than the stand and step down onto it. Climbing up onto it can dislodge it. Wear boots with non-skid soles, because steps or platforms can be slippery in rain, sleet or snow. Tell a dependable person where you’re hunting and when you plan on returning. Map your whereabouts and leave a note at camp, at home or in your car so that you can be found. Don’t fall asleep. This is a common cause of accidents. If you get drowsy, move your arms rapidly until you feel alert. Use updated equipment. 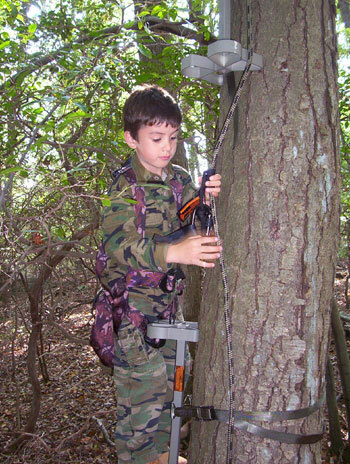 When used properly, newer tree stand equipment is solid, safe and secure. Older models of safety belts offer some protection, but newer safety harnesses offer more protection. Carry a whistle to call for help and carry a first aid kit, flashlight and cellular telephone in a fanny pack.